Realizing how vital the housing market is to the US economic recovery, Goldman continues to take on ambitions studies in that area. Their latest project involved the US homeownership rate. 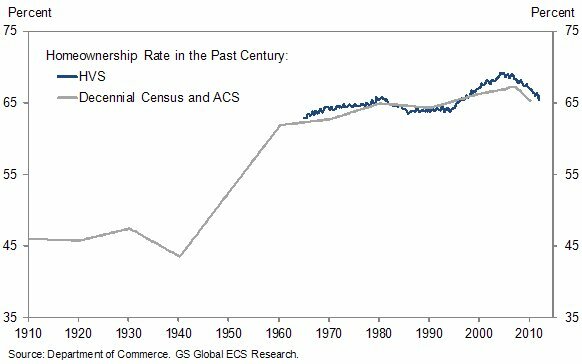 The chart below shows this rate over the past century based on the decennial US census and in the later years on the Housing Vacancies and Homeownership Survey (HVS), which is much more frequent. 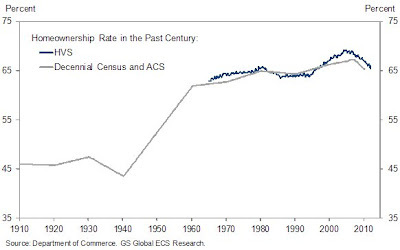 Homeownership rate fell off during the Great Depression, then grew rapidly after WWII. 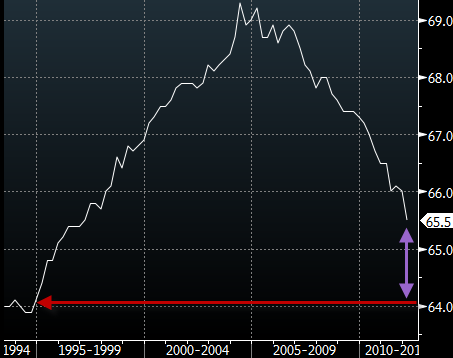 As expected the 2007 was the peak, after which the housing bust brought down the ownership rate. The question is what will happen next. Are we all going to live in rental units in the future? 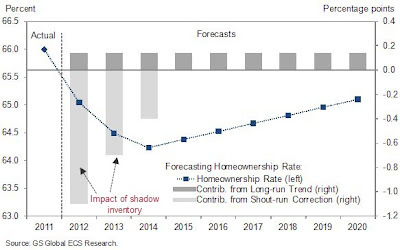 The model GS developed to make their forecast combines short and long-term trends that tend to impact homeownership. The short-term trend is clearly driven by the "shadow inventory", the impact of which is quite difficult to forecast. But it certainly has a negative impact on the homeownership rate because nearly 100% of those who lose a home in foreclosure end up renting. The long-term trends on the other hand have a positive impact on the rate, with factors such as "household income, education attainment, the marriage rate, and the older population share, all positively correlated with the homeownership rate". Below is the resulting forecast. Based on this model we are expected to bottom out in 2014 at roughly 64%. According to the recent estimates by the US Census, the last time homeownership rate had been at this level was in late 1994, some 20 years prior to the projected bottom.